Widely regarded as the world’s pre-eminent organization of fine art, antiques and design, TEFAF recently opened on March 16. With 279 participants grouped by specialty, this fair offers the best works available on the art market. 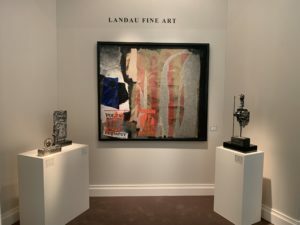 A number of press articles are already celebrating the quality of the 2019 edition, especially because of its Ancient and Classical art sections (see La Tribune de l’Art). Modern and contemporary art sections are also well represented: 25% of the participants are first-timers, which gives a feel of fresh air to the fair. Among those participants are top galleries such as Pace, Kamel Mannour or Georges-Philippe and Nathalie Vallois, proof of the quality of the event. 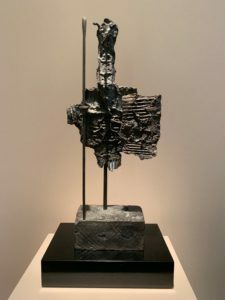 Top lots are also on view: many works by Dubuffet (Vache à l’herbage, 1954 at the Applicat-Prazan booth), or by Uecker (many great works on the fair, some at Beck & Eggeling International Fine Art), works by Hans Hartung or Yayoi Kusama are shown at the Boulakia Gallery booth, while Millares is to be seen at Mayoral and Waddington Custot…and so many other interesting works that it would be too long a list to cite them all! 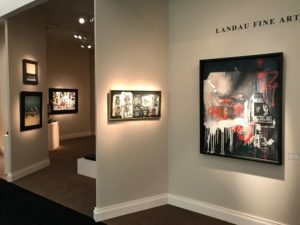 Landau Fine Art displays a beautiful selection of works by Antoni Clavé, dialoguing with works by Giacometti, Léger, Tinguely and Dubuffet; such an interesting mix…that can be discovered till March 24!